is a fun food item usually made of compacted shaved ice flavored with a brightly colored flavored sugary syrup, usually fruit-flavored. Snow cones are very popular with both kids and adults alike in late Spring and especially during the summer months. Concsuming a Snow Cone is a great way to "beat the heat"! Variations include the "stuffed" snow cone, with a layer of soft-serve vanilla ice cream inside. Some are served with a spoon and a cup, some are meant to be eaten with the hands like an ice cream cone contained in a paper holder. In 1934, inventor Ernest Hansen patented the first known "Ice block shaver" in New Orleans, Louisiana. He was inspired to create a more refined and hygenic version of the popular "Italian Ice" sold from push-carts in the city. His wife Mary created many flavors of fresh syrups to flavor his finely shaved artificial "snow". "Snow balls" have been popular in New Orleans ever since. Hansen continued to sometimes works at the origininal "Hansen's Sno-Bliz" in Uptown New Orleans through 2005, although his granddaughter has taken over much of the workload. Eventually, "Snow balls" became known as "sno-cones", and their popularity grew worldwide. 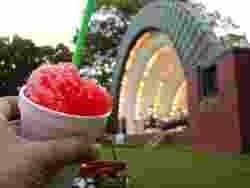 Usually, the snow cones are sold at stadiums, festivals, carnivals, church funtions, coliseums, Ice cream vans or by car peddlers at parks. Snow cones are crushed either by hand or with specialized, ice-crushing machines. In the United States, snow cones are produced mostly as a ball-shaped treat. In Puerto Rico, they are named "piragua", because they are made in pyramid shapes and "agua" means water in Spanish; hence the name "pir-agua". Most Puerto Rican snow cone vendors are street snow cone car peddlers. In Hawaii, snow cones are called "shave ice" (on Maui "ice shave") and are sold in cone-shaped paper cups. "Rainbow," a popular flavor, consists of three different colors of syrup chosen usually for their color rather than their intercompatability. In Mexico, snow cones are named "raspado", because the word raspar means "scratch", hence the name "raspado", as in "scratched ice". Snow cones are sometimes confused with "Italian ices" or "water ices", but water ice purists distinguish between the two: snow cones are generally flavored after production, at the point of sale, whereas water ices are flavored as the ice is made.